These are the books that will tie in with the upcoming Rugrats Go Wild film. All books due for release on 5/1/2003. 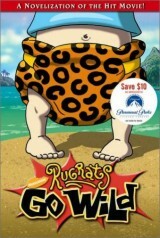 Rugrats Go Wild (novelisation) Cathy East Dubowski anonymous 2003 US: $4.99 0-689-85431-5 The novelisation of the movie. Includes 8-page color insert. 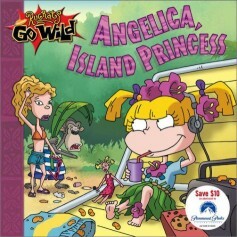 Angelica, Island Princess Lara Bergen Larissa Marantz and Shannon Bergman 2003 US: $3.99 0-689-85450-1 When the Rugrats disobeys Angelica's orders to stay where they are, she feels that her bossy days are over... until she meets Debbie. Spike Speaks! 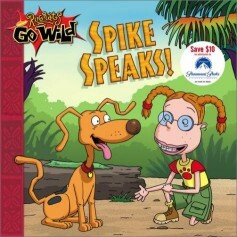 Terry Collins Jim Durk 2003 US: $3.99 0-689-85451-X Eliza and Spike have a chat with each other -- and ended up saving the Rugrats' lives. 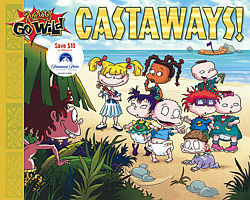 Castaways Sarah Willson Patrick Dene 2003 US: $5.99 0-689-85471-4 A storybook version of the movie.